When removing mold and mildew stains from painted surfaces, you can't just wipe off the black and green discolorations and consider the job done. Unless you also take the necessary steps to eliminate the cause of the problem and prevent it from reappearing, your efforts will be wasted. Mold and mildew spores are everywhere and there is nothing you can do about it. You can, however, prevent them from growing to a point where they become visible and create a potential health hazard for you and your family. Mold and mildew spores thrive in darker, warm, humid environments and prefer porous substances, such as flat paints, wood and textiles. 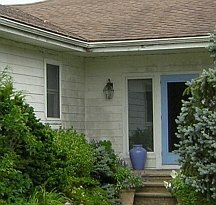 On the exterior of your house, black mold and green mildew grow abundantly on the walls that don't get direct sunlight, are shaded by bushes, or get wet often (from outside faucets or sprinkles, leaking gutters, etc). 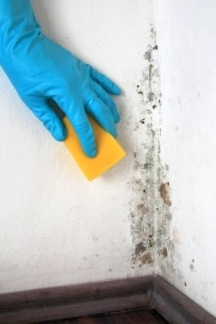 Inside your home, mold is pretty common in rooms with poor ventilation and high moisture content in the air (bathrooms, basements, garages), as well as water damaged walls. 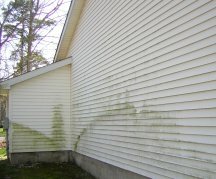 Mold and mildew feed on organic matter, so to remove their source of food, it's important to keep the surfaces prone to their growth clean, and pressure wash or repaint them as needed. If left unchecked for too long, they become very difficult to control and can even permanently damage (discolor) many surfaces - once they get too deep inside a substrate, you won't be able to reach the stains even with chemical removers. Mold and mildew growth is especially embarrassing when it's on the walls inside your home, but simply repainting or cleaning it off is never a solution that lasts long. Without finding and addressing the actual cause, your problem will quickly and surely reappear. When the problem seems bad or persistent, before removing mold and mildew stains from your walls, make sure there is no fungus infestation inside your walls. If there is, not only will all your work go to waste, but you will also be jeopardizing your health daily, without knowing it. Click here to find a mold testing service in your area. 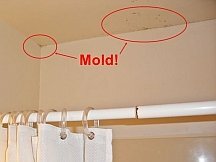 In case the testing reveals a major problem, you will need a mold abatement company to deal with it, but if the fungus has only eaten through drywall but not spread further inside the walls, you will need to cut out and replace only the contaminated piece to eliminate the source of the problem. To stay proactive, it's best to replace any drywall section damaged by a water leak right away, before it leads to mold and mildew growth inside the walls later down the road. Also, check and seal all gaps and cracks on the interior and exterior of your house to prevent rain from getting into the walls and creating the same expensive problems. And finally, if the cause is inside the room/house due to poor ventilation or high humidity, you will need to use dehumidifiers to control moisture levels in the air, open the windows regularly, and maybe even take the window treatments off to allow more sunlight in. These steps seem like a hassle but they are a must if you want to get rid of the mold and mildew problems for good, and not just as a temporary fix. Mix 1 part household bleach with 3 parts water to make a mold-killing solution. You can also use a ready-made commercial mold remover in a spray bottle (some are more natural than others), or a completely natural alternative such as 3% hydrogen peroxide or white vinegar (both undiluted, straight). Spray or sponge the solution on the affected area (wear gloves and make sure the area has adequate ventilation) and let it sit on the surface (bleach and commercial solutions take about 20 minutes to kill the spores and lighten the stains; natural cleaners may need much longer to work - up to overnight, possibly requiring reapplications). 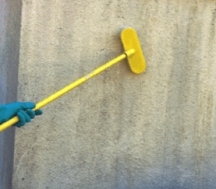 Once the time has elapsed, use a clean sponge and water to wipe or blot the residue off the surface (the cleaners may cause problems when painted over - such as paint breakdown or discoloration) and let it dry completely (if possible, use a fan directed at the area to speed up and help the process). Apply 1 coat of mildew-blocking primer (read the can) and allow it to dry. Apply 1-2 coats of mildew-resistant paint (most quality paints are) or, better yet, add a packet of mildewcide powder to your paint (sold in most paint stores) for an extra protection and peace of mind. Most likely you won't be able to just touch up the area without leaving obvious demarcation lines (especially if using a mildewcide additive), so be prepared to repaint each affected wall corner to corner. Also, for the walls and ceilings in bathrooms, garages, basements and other "suspect" areas, it's best to stay proactive and always add a mildewcide additive to the paint - even if you don't have any problems. Or, you can use a paint labeled "For Bathrooms" instead - it is formulated to be extra resistant to mold and mildew, and easy to clean. 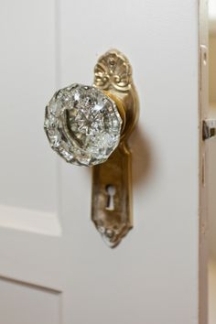 Because of their hard finish, semi-gloss and gloss paints usually don't need to be repainted or touched up after killing the fungus and cleaning the affected areas, so removing mold and mildew stains from painted doors and woodwork is a faster and easier job. But a glossy paint finish on the walls is a very tacky, cheap look, so if you want the same easy and low maintenance that glossy paints offer, use matte washable paint for your main living area walls - its smooth, non-porous surface is just as hard for the spores to eat through, but also aesthetically pleasing. Normally you don't have to repaint or touch up afterwards because quality exterior paints are formulated to be more durable and to withstand the use of chemicals, brush cleaning and pressure washing. To kill the spores, you can use bleach again, but if you are environmentally conscious or worry about the possibility that your plants and animals may be harmed, look for a safer cleaner alternative (there are a lot of green options commercially available these days - read the labels!). Apply the solution of your choice to the affected areas (using a garden pump sprayer is most efficient), and after allowing it to work for the recommended amount of time, scrub the area with a pole brush and hose it off. Alternatively, you can use a pressure washer to remove all cleaner residue (which may discolor the paint if left on for too long) and organic contaminants from the surface (so that there is not much left for fungi to feast on).